Those who have read The Ghost of Africa have been asking questions that I find very interesting, and I’d like to address some of them here. One of the most pressing is that of a little girl named Leza. Most readers are interested in whether or not she’s going to survive (if they haven’t finished the book yet) and I’ve even been warned not to mess with her character by some readers. “She’d better not die!” – is a common email from my readers these days. In the book, Leza is a sweet young girl struggling to survive leukemia where treatments are difficult—in fact, nearly impossible in the heart of Sudan. To make matters worse, she is thrust into the violent world of the LRA, a militant terrorist organization. The most commonly asked question – is Leza real? 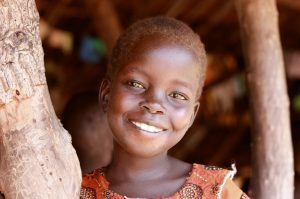 Since The Ghost of Africa is fiction, Leza can’t actually be real, but another little girl in Africa named Lisa inspired me to write about her. The real Lisa lives in Matta, the village where most of the action in the book starts and Leza lives, and where I have done quite a bit of medical relief work over the years. Lisa is the little girl in the photo above, and she’s as sweet as she can be. Her mother abandoned Lisa at an early age, possibly fearing she wouldn’t be able to care for her little girl properly. No one knows the full story, except that her young mother disappeared one night after dropping off Lisa at a friend’s hut in the village. Lisa’s mom never came back, but Lisa is a shining light in that village to this day, still living with the friend who took her in. The Ghost of Africa – available on Amazon.